When you constantly deal 2nd round picks and don't draft in the 2nd and then also miss frequently on your first round picks that's what your going to wind up with, fringe NHLers. I don't view it as a strike against scouts I view it as a miss use of the draft. I think it's pretty interesting that now the flames consistently draft in the top 2 rounds, with a similar group of scouts, their results have been substantially better. that's what baffles me, why on earth would they keep the same scouting staff with this draft record over the long haul? It's what scares me too, being in a rebuild and why I like the idea of being in a better draft position. Although, they did bring in that software that recorded all of the stats and players and likelihood of success, etc when Feaster came in. It seems to have helped. Maybe they're taking the scouts opinions more lately than they have in the past? From what I've heard under Sutter the first rounder was basically always his call and then after that he turned it over to button and company. When you think about a scouting staff basically never drafting in the first two rounds and then you examine the flames drafts since 03 the results actually arnt that bad. They arnt great, and on that note they have swapped out a few scouts and added some more part time scouts, but it's not bad. It's really tough to consistently pull out talent when your without picks in the top 2 rounds. One of the great things with Jay Feaster was that he knew what he didn't know and left professionals to do their jobs. Since 2011 (post Darryl Sutter), Jay Feaster has largely left the responsibility of drafting to the scouting staff headed by Tod Button. 2011 was stellar = Baertschi, Granlund, Wotherspoon, Gaudreau, and Brossoit. Potentially 5 full time NHLers drafted in one draft year. 2012 looks decent = Jankowski, Sieloff, Gillies, Kulak, Culkin, Gordon, Deblouw. Potentially 2 to 3 full time NHLers. 2013 still under evaluation but Monahan, Poirier, and Klimchuk are already looking very solid. Potentially at least 3 full time NHLers. We seemed to give the Windsor Spitfires a lot of latitude, as if our O scout was a Spitfires fan, or simply a bandwagonner of their Memorial Cup successes. From 11-13 I believe the entirety is still under evaluation. I get the "potentially" part, but I think it's getting a little too much sunshine. I'll take the high road of "pretty good drafts", but I'm not sold on many players from your lists. Sorry to have taken this off topic, but you guys have some great views for me to learn from, so I'm not really thaat sorry! I am with you on this because the jury is out until we actually see these players in the NHL and are regulars and meet their peaks. We all have seen players have success in lower leagues or in Europe that don't translate to the NHL. For me, it all depends on patience and development within the system. There has been improvements, but we still haven't witnessed star power from our development. There are a few bright spots like Brodie, and Backlund is finally scratching the surface on his "potential." Speaking of Backlund, he's proof of patience. He's run on 1 year deals of hope, that's how bad it got. He's a solid NHLer now. It's so hard to gauge, and a huge problem in drafting. Readiness is a task no one has nailed consistently. 3, 4, 6 years? Who knows? Each player is so different, simply by personality. I don't think they were very patient in Backlund and I feel like we may have seen this kind of play like this year maybe a year earlier or so had they just let him develop in the minors over trying to rush him into the NHL. For the longest time all they talked about for about 2 or 3 years was how he was supposed to make that next step. He was sent down a few times. Your thoughts don't include the fact he was often hurt. Everytime he seemed to get it going he would get hurt. Only when he returned from overseas did he seem to make the big jump in progress and even then he got hurt. The handling of Backlund was all wrong. He should have never cracked the NHL so soon. Sure he had talent at the time but physically and mentally I don't think he was there. He was not prepared for the speed and physicality of the NHL. He should have been given a year or 2 in the minors to adjust to the game and to get some size. Now in the case of Monahan I believe the right decision was made in burning a year of his contract and letting him play. Take away everything he's done this year and go back before he even played a game and Sean was as cool as a cucumber. He said the right things, came in to camp in great shape and established himself as being capable of handling life in the NHL. The question at the time was: Is his talent level there? Obviously it is. He was hurt and that was a huge factor but I think where the organization erred was bringing him up to play the 3rd and 4th line. That's where Sutter had it wrong IMO with prospects and insisting they play depth roles to learn defence and not putting prospects in a position to succeed. Backlund should have stayed in the AHL longer until they were comfortable playing him more and that's where I think the flames got it right with Monahan because they played him and played him a lot. I agree cross. The "depth" roles we ran everyone through was painful and hurt some prospects. It's diificult to say Backlund was ALL poor utilization, though it certainly played a role. It's nice we were between a rock and a hard place with a player like Monahan, but players like him are an exception. I think Backlund needed a change, so the shortened season seemed to be a silver lining and he came out of the SEL with a ton of confidence. I think a big thing with prospects is their background. I think a player coming out of a lot of losing perhaps has an edge in character. The Oilers, because they have lots of high picks, I think shows that. Highly celebrated #1's have a lot of hype to live up to. You take a 6th like Monahan and there really isn't a ton of expectation, and he's been beaten down enough as the best player on the worst team that he knows how to stay grounded and work through adversity. The Oilers didn't have to draft 1st overall with their picks. If their scouts and management staff did their jobs they'd have interviewed the kids, and had a plan on how to develop their team properly. It's great to have all of those 1st overalls, but they could have controlled the draft with that pick and maybe traded down with teams who could have wanted that 1st overall. Of course it's always hindsight. I honestly don't think that Klowe and the Oiler Scouts are good enough to have properly used this to their advantage. In a market where they openly claim that the only way they are going to be able to rebuild is from scratch, and able to attract high end players is primarily through the draft, you had better have the scouting staff to back up your drafting. They simply didn't and don't. They have drafted small and for speed while ignoring their D for far too long. Lets keep the discussion on topic. It's been a few days of letting it slide, but it's going nowhere. We have other threads for drafting subject matter, and Backlund's development. 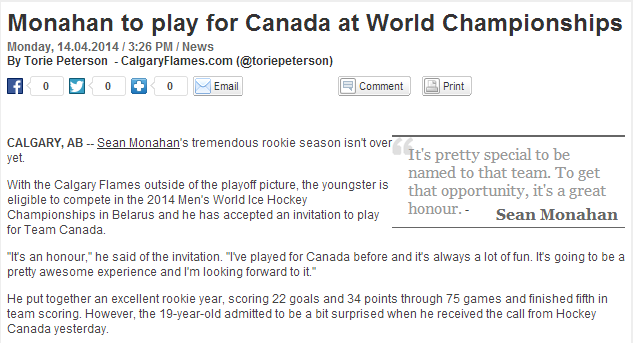 Congrats to Monahan on being named to Team Canada for the World Championships. I haven't seen anything on who was named yet. Where was the story/list? It was on the Flames twitter account. Wow congrats. I'm surprised he got the call. This makes up for missing WJC. Thanks guys. I'll have to check around & see who else (other teams) will be joining him. I'm glad he's going, this will help him develop into an even better player. I'm interested to hear everyone's opinion on where you think Monahan will be in his development next year. I think Monahan will continue to progress and not have a sophomore slump. I think he's a smart enough player and will take his off season training very seriously. I can see him hitting the 190-195 lbs mark and he'll learn to use his size more. We saw flashes of it in the latter half of the season and I think if he puts in a good summer we could see a much improved player. Points-wise I think he will avg the same as he did this year however I think he will get close to the 30 goal mark. He has the potential to put up even more but a lot of this will boil down to who his line-mates will be. Who knows what will happen? Will Treliving go out and sign a veteran FA or two? Will chemistry develop with one or two of the kids on the farm? These are exciting times for the Flames and their fans whether you like where we're heading or not. Lastly I would like to see Monahan take on more of a leadership role this coming season. I don't mean go out and give him an A or anything, I would just like to see his game progress to where he shows good leadership on the ice. I know he's not the most vocal person but there are intangibles, other than being vocal, that you can see in a player which shows he's taking on more of a leadership role. I guess what I'm saying is I'd like to see more swagger from him and see him gain more confidence. I want to see that drive to the net more often and establishing a strong presence there. I don't think he will have a Sophomore slump. Despite his goal totals, he struggled this season. Despite being sheltered he got pretty beat up in the puck possession department. He also didn't put up all that many points. What he did do was get better as the season went on. I expect more of that next season. I also expect to see him spend more time in situations like the PK as Hartley continues to challenge him. I think it depends on who they bring in. Monahan didn't exactly play with a ton of talent last year and thus why he had no problems scoring but points were down. I expect his goal totals to drop slightly but he could put up more points overal with more talent around him.